Eddy Co. - ABOUT EDDY CO.
Optical monitoring systems have been the cornerstone for 35+ years of Eddy Company's leadership for supplying solutions for production of complex precision optical coatings such as bandpass filters, beamsplitters, and lasers. The first monitors required the operator to make "cut-point" decisions. They were augmented by automated control systems that provided more reliability and accuracy. To respond to tighter specifications and increased yields we developed our planetary tooling with its counter rotating uniformity masking that provides unexcelled uniformity on large diameter substrates. 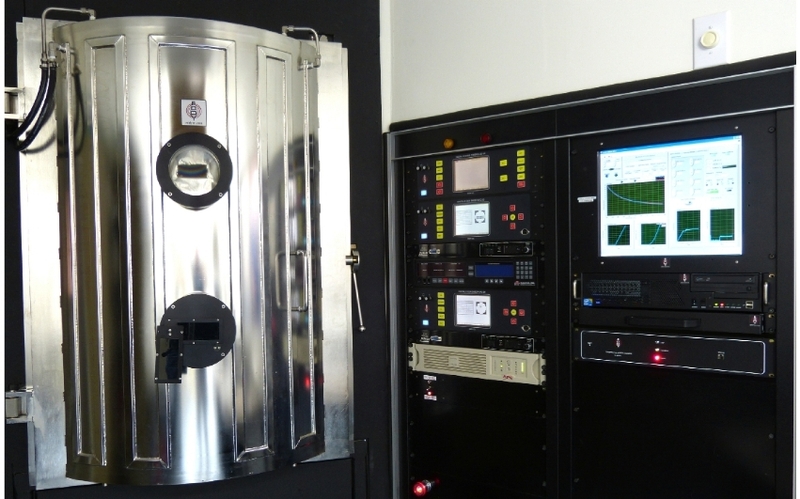 Electron beam sources, popular for PVD of coating, were a source of uniformity problems that we addressed by our programmable electron beam sweep controller. In response to many customers we produced a limited number of coating systems. Some systems featuring unique tooling for coating multiple surfaces others have load locks. Examples are shown in the products section. However, as a result of growth in other areas of our organization we have elected to not pursue sale of coating chambers. The SL-2012A SpectraLock optical monitor with exceptional precision and an ability to deposit thin layers using Index Dispersion Enhanced Monitoring (IDEM). The system shown is in our demonstration and development lab. We continue to advance & supply our electronic products and mechanical components for precision optical coating needs. We strive to maintain ease of operator interface with all our products. We willingly provide guidance garnered from our experiences to end users and/or cooperate with their system manufacturers.